The Ultimate Dual Cure Pick-Up Resin: Save $1k's - Build it right the first time! Fast and easy application. Extreme durability makes STELLAR an excellent choice for PMMA Denture to TI Chimney pick-ups and conversions and Locator pick-ups. Instant Auto-Mix. Tack cure and build 5 seconds, Light-cure 20 seconds, Self-cure in 120 Seconds. Efficiency and Increased Production: Our unique chemistry and technology offers the Oral Surgeon, CDT, and GP an acrylic that increases production, by dramatically reducing production times, which helps the bottom line. STELLAR's on-demand continuous flow of material allows quick and easy fabrication. SAVE TIME! BILL MORE HOURS! First use pays for syringe! Light cure 20 sec; Self-cure 120 sec. 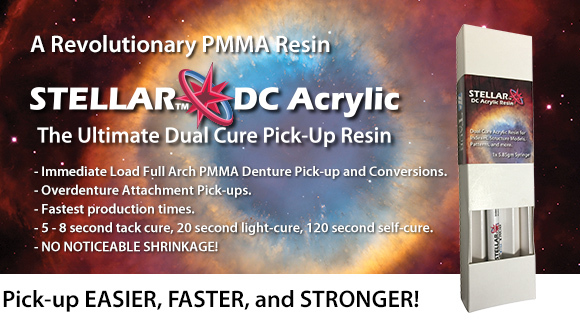 PMMA Resin chemically bonds to PMMA Dentures. Extreme durability - "Rock Hard"
When pressure / heat added. Burns out clean - "no residue". Material easily layered. 5 second tack cure. Excellent and accurate reproduction of detail. PMMA Denture to Chimney pick-up and conversions. 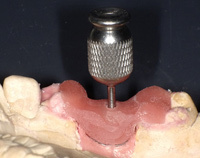 Create Implant Verification Jigs, Implant Abutment Seating Guide, Indexes. Position misaligning implant components during seating. Connect or fix single implant parts for soldering and welding. CDT and Oral surgeon approved.